The Korean prosecutor’s office leading the StarCraft 2 match-fixing investigation released its report this week, and the results are not good for fans of the sport. One of the game’s greatest players, Lee “Life” Seung Hyun, now stands convicted of match-fixing, as well as another leading player, Bung “Bbyong” Woo Yong. That’s only half the bad news. The other half is that for those thrown-matches, Life was offered about $60,000. In other words, as TeamLiquid editor Kwanghee Woo pointed out, Life made seven times as much money throwing two games than he would have for winning the entire tournament. This is the kind of gambling money flooding into esports in Korea. With that kind of disparity between what players can make honestly versus what they can make cheating, it seems like guaranteeing StarCraft’s competitive integrity is an uphill battle. It’s a bleak outcome for StarCraft fans. Life wasn’t just a great player, but a central figure in several of the most exciting moments in the sport’s recent history. A precocious talent who took down some of the best players in the world as a young teen, Life seemed like the kind of person who would never be caught match-fixing. Too much to lose, too much money, too much potential for future success. Confirmation that Life did, indeed, take bribes to throw matches pretty much shatters whatever illusions StarCraft fans may have had about the security or sanctity of the game in Korea. Team Liquid has a complete run-down and translation of the summary report, with helpful glosses about who is who in this story, since the report itself makes an attempt to conceal the identities of those involved. In total, eight people have been arrested and charged, including some of the financial backers behind the scheme and their employees, as well as the brokers who helped arrange the deals. Life apparently received a suspended prison sentence, so he doesn’t have to go to jail if he avoids further legal trouble. Ominously, the report indicates these are not crimes of opportunity. The Changwon Regional Prosecution Service’s report noted that these match-fixing conspiracies follow a clear and established pattern. “The crimes were perpetrated with clear division of roles: Financial backers to put up the compensation for match-fixing, brokers to solicit the match-fixing and transfer the funds, and an employee in charge of receiving gambling funds and placing bets on gambling sites,” the report stated. In other words, the backers put up the money, the brokers arranged things with the players, and then employees went around to online gambling sites and placed a series of smaller bets on the rigged games so as to not run afoul of max-bet limits and (presumably) to conceal what was actually happening from the sites themselves. Life greets his fans at BlizzCon in 2014, where he was crowned world champion, by Blizzard Entertainment. While Life was paid about $30,000 per thrown match, the gambler behind it was putting up about $44,000 in online bets at 1.3-1.5 odds, which meant he would have cleared about $56,000. Both Life and Bbyong were approached by brokers “under the guise of being a fan” and, later, their new friends convinced them to join in match-fixing schemes. Depressingly, they were convinced in part because the brokers told them, in so many words, that everyone was doing it. Which, given the trend in match-fixing allegations in StarCraft, might not be a huge exaggeration! The other thing that’s striking here is that these weren’t huge matches that were fixed. Right now, the evidence suggests that the big matches are on the up-and-up. What these players threw were the tournaments or games that didn’t cost them much. Obviously, ultimate responsibility for match-fixing lies with the players who take part in it and the gamblers who arrange it. But there’s some important context here that shouldn’t be missed amidst all the moralizing. 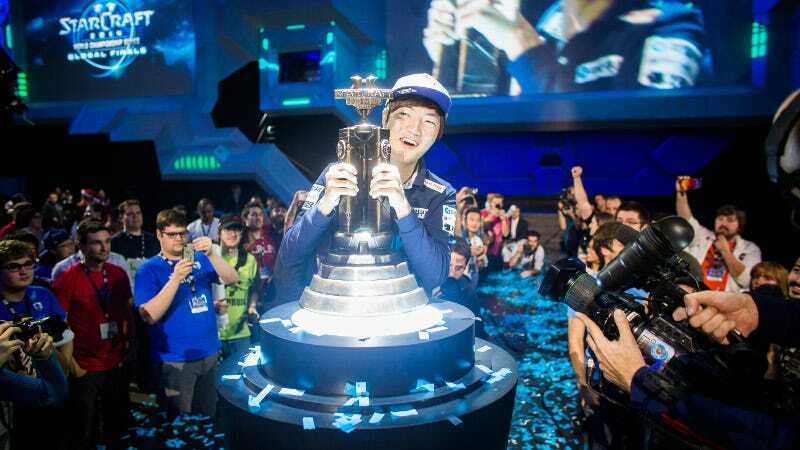 First, many StarCraft players are extraordinarily young. Life is only 19 and was 15 when he won his first major championship. Despite the heroic way in which some of these players are portrayed in hype reels, they remain little more than kids who operate under some truly immense pressures within controlling environments. Yet somehow, even a leading organization like KT Rolster failed to prevent a star player from falling under the influence of shady characters. No doubt Life is going to receive a lifetime ban for this, and a lot of his results and achievements will likely be vacated. It’s troubling how easily match-fixers were able to access these players, and influence them without anyone else becoming aware there might be a problem. Second, Korean StarCraft organizers have repeatedly kept prize-pools skewed heavily toward the top. When Blizzard tried to make the cash distributions more equitable via the WCS, Korean organizations pushed back and eventually restored their “winner-takes-most-of-all” prizing. In GSL Season 1 last year, the tournament in which Bbyong threw his match, the first-place finisher received about $36,000. The runner-up? $9,600. And if you were knocked out in the quarterfinals? You got $2200 for the season. There may not be enough money to go around StarCraft to create a financial incentive to resist gambling rings. But right now, it feels like StarCraft is drowning in gambling money, and the compensation for all but the winning players is so poor that a broker’s offer could look like a very attractive way of mitigating risk. What is losing a single game in the round of 32 or 16 next to $30,000, when most players would be lucky to get a quarter of that playing honestly? And when the math is skewed that badly towards cheating, how do you clean up the game?